One of my favorites has always been salmon patties...had our new version again last night...with creamed peas and fresh tomato slices from the garden! That's a pretty cute meal that he would make for you! My favorite childhood meal is pancakes! On the weekend my dad would always make me pancakes the size of the plate, or my mom would make them in the letter of our first initial! One of my favourite dishes my mom used to make us when we were kids was hamburger goulash. It was hamburger with peas in gravy served over mashed potatos. I loved it. Oh I love that dish, it's so unique! I guess the food that reminds me of my childhood would have to be Boston Chicken's (yes, takeout) creamed spinach and cornbread! Also, my father's awesome chili, and my mother's amazing tuna noodle casserole. SO DELICIOUS! ohhhh i ate a dish (kinda) similar to this in Thailand, however they used massive amounts of ketchup, and quite frankly, i cannot stand that condiment. ultimate comfort food? chili, ice cream and apple crisp! I love omurice! When I spent a summer in Korea during college I ordered it a lot at little mom-and-pop restaurants. Sometimes we make it for dinner too. But we add a squiggle of ketchup across the top which I like. It sounds really delicious. I love over easy eggs on anything. My comfort food is chicken pot pie. It would have to be soft boiled eggs with toast fingers, for sure! Your rice sounds really delicious especially with the egg on top, yum! My favorite meal from childhood is Russian vareniki which is similar to ravioli. Oh, drooool, I love bap + eggs + seaweed (aka gihm)! When I wouldn't eat anything as a kid (hard to believe, I know! 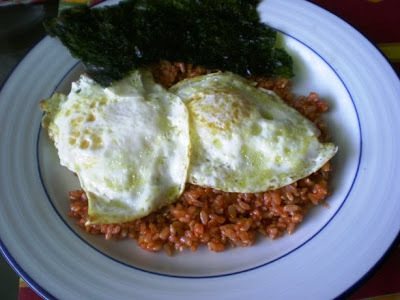 ), My mom would fry up an egg and mix soy sauce, sugar, and rice together with some kimchi on the side. Totally comfort food for sure. Although, I'm sure it would taste better with gihm. Mmm. I'm a soup person, so always love having veggie soup for dinner. I eat all the veggies in the pot too. that meal does look really good! although definitely one i have never seen. yum though. favorite childhood meal for me is "cocoa & toast" as we called it, but it was just milk mixed with quik and heated up paired with white buttered toast. and then you would dip. most comforting meal ever to me.. weird. That dish looks a lot like some of my meals. I't looks fairly easy to make and healthy for comfort food. I'll give it a shot. Thanks! It's so funny that one of my late-Dad's favorite simple dinners was just plain steamed rice with eggs on top just like that. He'd drizzle a little oyster sauce over it. Now, my husband takes any excuse he can to top whatever he eats with a fried egg. There is something just so homey and comforting about a fried egg. One of my favorite meals growing up was the pizza my mom would make on Sunday nights. She always bought a 'kit' that included the premade dough and sauce and then we would top it off with thick cut pepperoni and cheese. We always had pizza on Sunday nights and watched the Disney family movie of the week. Honestly, I wouldn't make that pizza now, but the memory of my family all gathered together for the weekly ritual of dinner and a movie is something I'll always hold close to my heart. my mom used to make chicken with baby corn. loved that stuff. My comfort food is a grilled cheese sandwich with a nice bowl of tomato soup.